The Ebac WM150 dehumidifier is a medium capacity, commercial quality unit suitable for a wide variety of applications, including offices, apartments, stores, restaurants, bars, salons, museums, storerooms, computer and telecommunications rooms, garages, cellars and animal enclosures. The WM150 is a versatile dehumidifier with a broad operating temperature range and multiple installation options. The pleasing yet discreet appearance of this unit makes it suitable for use in public areas and with a compact design, configured for wall-mounting, it can be fitted easily in even the busiest locations where direct services to customers are provided. The Ebac WM150 dehumidifier has a water removing capacity of 71 pints per day at 80°F and 60% relative humidity. These are the conditions specified by the Association of Home Appliance Manufacturers (AHAM) for testing dehumidifiers at a single standard to make comparison between one model and another more meaningful. Water extraction rates vary, rising and falling as temperature and/or relative humidity increase and decrease. In more extreme conditions the WM150 will extract more water from the air, rising to a maximum of 27 gallons per day (@ saturation). The unit discharges the condensate by means of continuous drainage. A condensate pump is an option, at extra cost, but may not be necessary in many applications, particularly if the unit is wall-mounted. If low temperature operation is required this unit is well able to deliver it. The unit is equipped with Ebac's reverse cycle defrost system which actively defrosts the coils and minimises down-time. This feature enables the WM150 to operate at temperatures as low as 33°F which is a low as is practical for a refrigerant dehumidifier. The unit is also effective in the higher temperature range, up to a maximum of 105°F. Although this is a powerful unit it is also energy efficient, drawing only 8.5 amps in operation. The high performance, cross flow fan contributes to this efficiency and also to the low noise level of only 58dB. The Ebac WM150 dehumidifier offers two installation options. It may be operated as a stand-alone unit and has rubber feet to minimise vibration-induced noise if this option is chosen. Alternatively the unit may be wall-mounted if preferred which may well be more suitable in a heavily used public area or where floor space is limited. The unit is compact by design and its small footprint and shallow depth (just 12 inches) are an advantage whichever installation option is required. The WM150 incorporates an adjustable humidistat which can be programmed for the level of relative humidity required. The humidistat monitors the moisture content of the air and cycles the unit on and off to maintain the pre-set level. This assures a constant level of relative humidity and also saves energy by preventing the unit from unnecessary operation. 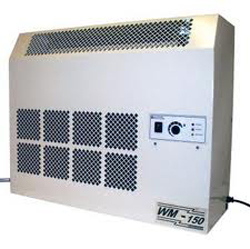 Like all Ebac commercial dehumidifiers the WM150 is a strongly built and durable unit. Robust components are enclosed in a sturdy steel casing which is coated with a tough epoxy-powder coating to withstand minor impacts and to preserve the appearance of the unit.